Nathan Parker 2 months ago. The new Mojave update is now available for my new IMac which is on High Sierra. I don’t undersand the update policy as I am coming from Win7. However, if I do not update to Mojave how does this influence my future updates? Can I update to the next one after Mojave if I did not update to Mojave? I’m confused about how many updates one can do until the IMac cannot be updated. Any enlightenment about this process will be greatly appreciated as my googled attempts are not helping. Macs are not like Windows. I have never have an update bork any of my Macs (iMac, iMac4K, MacMini, MacBook Pros 13″ and 15″). Updates are good for security reasons, not just features. You can skip an update if you wish – they come around about once a year. My 2011 13″ MacBook Pro has had Lion, Mountain Lion, Mavricks, Yosemite, Sierra and now High Sierra. I have updated each time (not necessarily immediately after the update comes out). It will not be eligible for the Mojave update, but will continue to get security updates for at least two more years. Updates take less than an hour – download, install, boot up. They don’t mess with your settings or programs. Soooo much easier than Windows!! Love my Macs. It might be too early to move to Mojave. People are reporting on line some problems with it, which is not surprising since it just came out and there are always wrinkles to iron out in a new operating system before it is OK. I always wait at least one year before moving to a new version of any system, be it Windows, Mac or whatever. You can update at any time, but must update before the third version, after the one you already have, of the operating system (macOS) comes out, then you are good until the third version after that comes out, and so on. So you should be OK with High Sierra for quite some time yet, if you preferred to stick longer with it. Usually, a new version comes out once per year, so you are OK with your version of the operating system for as long (max.) as three years, depending of how old your version was when you installed it — or it was pre-installed in the Mac when you first got it. How old is a version? Its age is counted from the date when it first came out. You can install a new version any time you want, before the third one comes out, and can update to the next version (Mojave, in your case) or the one after that, if when you finally update you are already two versions behind. There are no penalties. For example: I still have Sierra in my Mac. Now I could upgrade from it to High Sierra or to Mojave at any time. But before the next system after Mojave comes out I must upgrade at least to High Sierra, to be again only two systems behind the latest one. However not all in a transition to a new system necessarily goes smoothly: of the applications now installed in your Mac, some of those that work just fine now may not work, or work poorly, with the new operating system. And then you’ll have to get the new versions of those applications and install them to replace the old ones. That can be a nuisance, but is a “do it now and then you are done for up to one or more years” sort of thing. I have a one year old iMAC that came with Sierra. Shortly after I got it, High Sierra came out and I installed it right away. One hour and 10 minutes from hitting the install button to back up and running normally. Flawless and seamless! The last major update to High Sierra is 10.13.6, so that’s what you should be running right now. I believe there are no more major updates scheduled for High Sierra (i.e., no 10.13.7). But you might still get updates which you should check for through the App Store (or maybe you have updates set to go automatically) and install since they may have security fixes. I’m not planning on moving to Mojave anytime soon as I believe it will mot support 32 bit programs and I have a few of those I’d like to keep running. One other nice thing is that when I check for updates at the App Store, it doesn’t tell me Mojave is an update for my machine. It’s very clear from the App Store main page that Mojave is available, but there is absolutely no pressure exerted by Apple on me to download it. Big thanks all around to DrBonzo, PKCano and OscarCP for your very timely and detailed explanations! You have greatly helped me to understand the Mac updating process. I will ultimately update to Mojave but will wait a little while to see if they address any bugs. Yes, I am running High Sierra 10.13.6 for which I recently installed the update to it that was provided. Do any of you recommend a site where they evaluate the updates, etc. for the IMac — something similar to Woody’s for windows? I found a few articles but no site for Macs that compares to Woody’s. Being a non-techie I decided on the IMac which was a one-and-done rather than going the route of things like Linux which I was not as comfortable with. However, I know that for many of you very knowledgeable techies Linux etc. will be the preferred jumping off place. I will say that the learning curve for my IMac was not much of an issue — not that much appreciable difference from windows. Of course, one does not know what one does not know — ignorance is bliss — but in my case it was even easier since I do not use the computer for anything more esoteric than a little e-mail, a little surfing and a little Libre Office. Everyone pretty much covered it. Just to reiterate a few points. Apple releases a new version of Mac OS annually in Autumn. That release will get mainstream support for the first year, usually with 5 or 6 point updates through out that year. Then continued security updates for an additional 2 years. iTunes will still be supported for an additional year after that. What I don’t understand is the circumstances whereby Mac users cannot update anymore (or should I say be “supported”. If I am comprehending corectly from this blog that you must be only 2 systems behind the latest one at any time how can my IMac be unsupported? For example, I am on High Sierra now. If I install Mojave this year and each year install the new OS will my computer reach a point of not being supported? Support for Macs is based on the Model. In the top menu, click on the apple\About this Mac.For example, my iMac says iMac (Retina 4K 21.5-inch 2017), my MacBook Pro says MacBook Pro (13-inch Mid 2012). Both are running High Sierra. But the latter will not be supported for an upgrade to Mojave. However, it will receive security updates for High Sierra for two more years. You do not have to upgrade High Sierra this year or next year. But the OS can only be two years behind the current version. So at the point two years from now when the third new OS comes out, you will have a choice to upgrade to Mojave, Mojave +1year, or Mojave +2years. As you progress through the upgrades from year to year, there is a point when Apple says it will not support your model for the next OS upgrade. At that point, you will have two more years of Security updates before the third version after yours comes out. It amounts to about 10 years support. But you can still run the Mac afterward – without security updates, like what happens when Windows goes EOL. So my old 13″ MacBook Pro is supported till fall 2020 when the new OS comes out that year. @pkcano — so sorry — I did not see your post #220371 before I wrote mine! Each new OS is supported with updates for a three year period after it is introduced even though each year a new OS comes out. For example, Mojave will get updates from 2018 – 2020. The other factor is the model — since your MacBook Pro is Mid 2012 (presumably because of the 2012 date?) it cannot update to Mojave but will still get security updates for High Sierra for two more years. So the real reason one cannot continue to update forever is the Model/year of your computer is the determining factor but from your description I can go through the process for abouit 10 years. The choice of which version of Mojave to upgrade to when the third new OS comes out — which version shoud I choose? 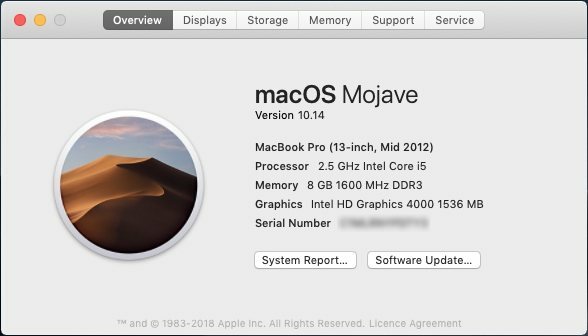 What is the benefit of the original Mojave vs +1yr vs +2yrs? And are the three versions listed as separate updates in the App Store? I upgrade every year, not necessarily right when the new OS comes out. I am not so much into feature additions as I am into security additions. I am still running High Sierra on all five of my Macs. I probably won’t upgrade them for a few more months. But the 15″ MacBook Pro (laptop) I use to run the diving scoring and scoreboard for the University in my home town. And once I verify the Dactronics equipment (diving scoreboard and console) works correctly I won’t upgrade it until the diving season is over at the end of Feb 2019. I can’t afford to have a problem (although I have never had one so far with any upgrade). Incidentally, I run Windows in Parallels VMs on all my Macs and upgrading has never messed them up. Now Windows updates, that’s another thing! The California naming convention began with Maverics, then Yosemite, Sierra, High Sierra, now Mojave. You may be further confusing me! The difference between a new OS every 3 years vs an update to the current OS is getting fuzzy. You seem to be suggesting that Mojave will have no more updates after August 2019? Am I understanding that you are calling Mojave+1 or “Death Valley” new OS’s? Correct, the OS that comes out in the fall of 2019 will not be Mojave. But since I have no idea what it will be, I just called it Mojave +1year. After the new OS comes out in fall 2019, Mojave will continue to get updates until fall or 2021 when that new OS comes out. But you will have three new upgrade versions to choose from between now and then. Eureka! I’ve got it!!! Thanks for your continued patience. That was the sticking point when it was called Mojave+1yr, etc. Much obliged!! Everyone — If you remember, please give me a shout-out when you decide to upgrade to Mojave and what your experience has been. Here is the information in ComputerWorld So my old 13″ MacBook Pro is supported till fall 2020 when the new OS comes out that year. However, whilst all worked well for the first couple of days I’m now experiencing some problems, almost like I have the left mouse held down and/or a CPU intensive process interfering with normal operation. There are entries in the Apple System Log about memory that I don’t understand yet Activity Monitor shows nothing untoward. Please report back when you do. I will be interested in knowing their answer. It was one of the last of the 13″ with the slot CD drive. I upgraded to 16GB RAM and a 512GB SSD also. Still has a beautiful screen and runs like a champ. Well, I’ve just discovered the culprit (I think). The problem started again and I lost control of both keyboard and mouse. I regained control after I turned my Apple Magic Mouse off. I turned it back on again and all’s well (and Battery Level shows as 74%)… so I’m going to keep an eye on it and replace the batteries if it happens again. Unfortunately I don’t have another Bluetooth mouse to try but I’ll keep a watch out for any reported Bluetooth problems. I’ve found one so – following advice – deleted the /Library/Preferences/com.apple.Bluetooth.plist file, restarted and re-connected the Magic Mouse. All seems OK (for now… 🙂 ). Appears to be a typo in the computer world article. Currently the article includes “2017 (12/2017) and later Mac Mini” in the Mojave approved list. I believe the author meant 2012 (12/2012). Hopefully will get corrected. Here’s the official list from Apple for Mojave support. If you have upgraded from Sierra to High Sierra in your MacBook Pro, what was that like? Any problems? Anything that did stop working well or at all? Thanks. My 13″ MacBook Pro (oldest) started out with Lion. My MacMini, iMac, and 15″ MacBook Pro started with Mountain Lion. They are all on High Sierra. They all are running between 3 and 5 Parallels VMs. I have a mixture of programs: Apple products (IWorks, iTunes, etc) and third-party (MS Office, Acronis Backup, Firefox, Waterfox, Thunderbird, VLC, Kindle, Malwarebytes, TrendMicro, CCleaner, Calibre, Adobe Reader, Java, Flash, Segate Dashboard, NTFS for Mac, and more mostly free). On occasion I have had to update a version of a program to be compatible with the new OS, but mostly there is no problem. I have updated all of them each year to the that year’s current OS and have NEVER had a problem with any of the upgrades. I bought both my MacBook Pro and an older MacBook with Sierra and updated both to High Sierra. The process was superbly easy and fairly quick (much easier/faster than a Windows upgrade). Like PKCano, I too haven’t had any problems with either and found it a worthwhile upgrade (particularly on the MacBook Pro which has a SSD), especially Safari which by default mutes those really annoying websites that automatically play audio/video (seemingly always at full volume). Well, rats. It happened again… I lost control and it appeared as if the left mouse button was held down using either my Magic Mouse or the built-in trackpad. The problem stopped the moment I turned the Magic Mouse off and the Bluetooth connection was lost. Try using another (magic) mouse. Do you get the same results? Do you also have this problem using the track pad? Or is it, as far as you can tell, coming from using the magic mouse? As mentioned in a previous post, I don’t have another ‘Magic’ or any other type of Bluetooth mouse. However, I fired up my old 2009 MacBook and my Magic Mouse appears to be working fine with it. I also attached a USB mouse to my MacBook Pro and that too appears to work absolutely fine. As a result, I suspect Bluetooth in Mojave. As mentioned 2 posts ago, this affects the built-in trackpad as well… but only when the Magic Mouse is connected. The moment the Bluetooth connection is lost (e.g. by switching the Magic Mouse off) then control is returned… hence my belief that Bluetooth may be the cause (as the Magic Mouse works fine on my MacBook). Thanks, Rick. Perhaps someone with a Bluetooth keyboard, printer, etc. and that has installed Mojave already, could give using one of those a try and report here how that went. I’m back again with one more question. I have decided to wait at least a few months to install the Mojave OS. From reading it seems that whenever you decide to install the Mojave OS it will be the original version (minus the updates) and after installation you can update it. Is this correct — or is there a way to install the updated version(s) directly? I have decided to wait at least a few months to install the Mojave OS. Good choice. Mojave will be around for three years. There is no rush. I haven’t updated mine yet either (not that I’ve had the time!). I think, if you wait a few months, you will get the revision that is current then if there has been one. Am I right in thinking that waiting for such revision would be roughly equivalent to waiting for a Windows Service Pack? No, a revision to one version of MacOS is not like a Service Pack. Service Packs in Windows are major revisions. They don’t happen with any frequency. The revisions to one version on MacOS are more like monthly Rollups, only they don’t necessarily happen that frequently. And they are more like tweaks than a wad of feature changes that Service Packs represent. And they rarely if ever cause BSODs, don’t wipe out your data, or remove your programs. In this article they say: >If you choose to wait and download a version of Mojave some months after the launch – or if you are looking at updating your Mac to an older version of MacOS – note that the version you will download from the Mac App Store will be an older version than the latest update. You should therefore expect to have to update the operating system again once you have installed it, but this should happen automatically. This is where I got the idea that if we wait to install Mojave we will be installing the original version and then have to upgrade it — am I mistaken? Looks like you were right. I have never experienced that, but I may not have waited to install until after there was a revision. I run all those programs you mentioned on my Macs. In addition, Firefox, Waterfox, Calibre, Kindle Reader TrendMicro Premium, Acronis, Adobe Reader, Office for Mac 2016, and Parallels Desktop that allows VMs for multiple versions of Windows from XP to Win10 Insider’s. Check out our MacOS for Windows Wonks Forum. There are several informative topics. I just migrated to an IMac a few months ago and am very happy. I use Malwarebytes, Libre office and have used Thunderbird and all are compatible. You will find when installing things like Malwarebytes, etc. they have a Mac Version that you select. My computer tech recommends Malwarebytes and I am happy with it. I think the days of Macs requiring no antivirus programs are gone. I have MacOS El Cap 10.11.6 on my MacBook Air 13″. The main reason I haven’t gone for an upgrade to Sierra/High Sierra is because I use older programs like Lightroom3 and Photoshop Elements 14, and performance is compromised by any upgrade at this point. I also have other Apple devices that run flawlessly in sync with El Cap, minus the Notes app but no big deal for me. These other two devices also run in dinosaur mode on iOS 9.3.5. I’m not into new features and I don’t want to lose access to some of the hardware or software I use with the Mac. So I’m wondering if sticking with my old OS and iOS devices am I running too great a security risk once I hit EOL with El Cap? I run the highest level of Norton AV on the Mac and so far I haven’t had issues staying with iOS 9.3.5 for the iPad Air2 and iPhone SE. I do a full system backup on a regular basis for the Mac, which has my standard practice with all my machines. I’ve looked here there and everywhere online for info and it wasn’t until I found this Mac Forum on Woody’s site that I felt some relief in getting answers. Thanks in advance. So I’m wondering if sticking with my old OS and iOS devices am I running too great a security risk once I hit EOL with El Cap? There may be some security risk by sticking with an EOL version of MacOS. But I think the greater risk down the road (not immediately and maybe quite some time off) is some of the basic apps won’t be supported. Example: suppose at some point Norton stops supporting El Cap, or sites on the web stop accepting your version of Safari and the alternates like Chrome and Firefox won’t install on the older OS. This won’t happen maybe for several years. But it is what has happened to XP in the Windows world. Sites stopped supporting /accepting IE8. I switched to Firefox and now FF has stopped supporting XP. Same thing happened with anti-virus. I suspect you will be OK for several more years. But eventually you will probably have to move forward to a newer environment, and just keep your present system only for the purpose of the apps that won’t upgrade. Maybe you could just hold out using the aging Mac where you are running “El Capitan” and buy yourself a new one when that one runs into software and communication obsolescence problems, while still using it for all those things you want to keep on using it, but probably also off the Internet? At least until it finally progresses from obsolescence to senescence. That’s what I would do with my Mac, and shall, when the time comes. Same thing goes for my Windows 7 PC, except I won’t buy another Windows machine, unless until MS sees the light, confesses its sins, sincerely repents and meaningfully atones for them. Which I somewhat doubt it will ever do. So, off the Internet it shall go, when its time comes. I have upgraded my two workhorse Macs (Late 2012 Ivy Bridge i7 MacMini and 2017 retina 4K Kaby Lake i7 iMac) from High Sierra to Mojave in the last two days without any problems. + I had to update the TrendMicro to the latest version, the older version was not compatible. This did itself automatically after giving me a notice and me giving permission. + I had already upgraded Parallels Workstation for Mac to v14. + I had to reconnect the trackpad on one of them – by pushing the “connect” button on the side. + I had to reconnect the WiFi on one of them by pulling down the menu and choosing my network (both are connected through Ethernet AND WiFi). + I also didn’t like the dark theme as well as the light (eyesight failing in old age?). Altogether, the upgrades were a non-experience. So, two down, three to go. This will be a long month with 14 Win VMs to update, 4 old Win7 h/w installs to updates, and the Macs to upgrade. Thanks so very much PKCano for sharing your updating experience with us! I’m still waiting on the sidelines because I use none of the Apple Apps and none of the new features is of interest to me. I don’t use Safari so the extra security for that is moot. However, I will update when I get a little more courage. Maybe I’ll wait for the first revision which is still in Beta — although there doesn’t seem to be many kinks reported. I have just installed Mojave version 10.14.1 (this updated version came out yesterday). No problems. Took about an hour. I also picked the light theme as my eyes need light! I am thrilled that I took the plunge and installed Mojave. I didn’t have any Apple Store Apps and everything I had is compatible e.g.Libre Office. Also, the computer wakes up from sleep faster than from High Sierra. In addition, the computer immediately installed the latest vesion 10.14.1 which answers my questioning above as to whether the version to install would be Mojave 10.14 and then we would have to upgrade or the latest version installs. I was not interested in any of the bells and whistles that Mojave brings but I wanted to install it for security reasons and also to be up to date. Thanks PKCano for giving me the nudge. You certainly were right when you said moving to the Mac takes away all of the monthly stress I had on Windows 7 updating. Actually, it’s not quite 100% that Mac upgrades are trouble-free. Merely almost always. After all, I did once manage to end up with an unbootable Mac – it had been used to test a little-known third-party full-disk encryption product that turned out to be incompatible with the new version. Yeah, but that was a PEBKAC not the Mac. In terms of updates, I upgrade my Mac to every major macOS release and never skip major releases. It is true that upgrades are dependent on hardware models. My 2011 iMac is stuck on High Sierra and doesn’t qualify for Mojave. Mojave was the first release in a while to seriously cut off some major older Macs due to the transition of the graphics system to Metal from OpenGL. Generally, it is safe to upgrade your Mac every year to the major macOS release, especially since they are now free. However, even if you skip a year or two, you generally should be able to in-place upgrade without issues. I took a Mac from Snow Leopard to Yosemite once in a test just to see if it’d upgrade successfully. It did. 1. When major macOS releases come out (like Mojave), I generally prefer to wait until the .1 release hits before upgrading (so for Mojave it would be 10.14.1), plus I generally wait about a week after the update hits to read tech news to see if the .1 update has been installing smoothly or causing issues. This year was the exception where I upgraded to Mojave about a week after was released since I needed to resolve a bug I was encountering in High Sierra. 2. When minor macOS releases come out (10.14.2, 10.14.3, etc. ), I try to wait until the Friday after they’re released (since Apple generally releases them around Mondays but not always) for two reasons: A. It gives me a chance to check tech news to see if there’s any issues with the update and B. It allows me to test the updates over the weekend, reboot my Macs after updating, and ensure all goes well before the work week. 3. I generally follow a similar path for iOS, watchOS, and tvOS, and when major OS upgrades occur, I wait until the .1 (for Mac) and .01 (for iOS, watchOS, and tvOS) updates are available before upgrading, then I upgrade across the board so everything syncs successfully with iCloud. I generally upgrade in this order: iPad, iPhone, Apple Watch, Mac, Apple TV.